The popular hatchback with standard all-wheel-drive gets better mileage without sacrificing its wet weather and off-road abilities. When Subaru first began selling the Crosstrek in America in 2012, I thought it was the perfect vehicle for the Pacific Northwest. Based on the already-popular Impreza hatchback, it already came standard with the company's impressive Symmetrical All-Wheel Drive system, which handles rain and light snow with ease. And it was raised to give nearly nine inches of ground clearance, making it bettter suited for light to medium off-road driving. 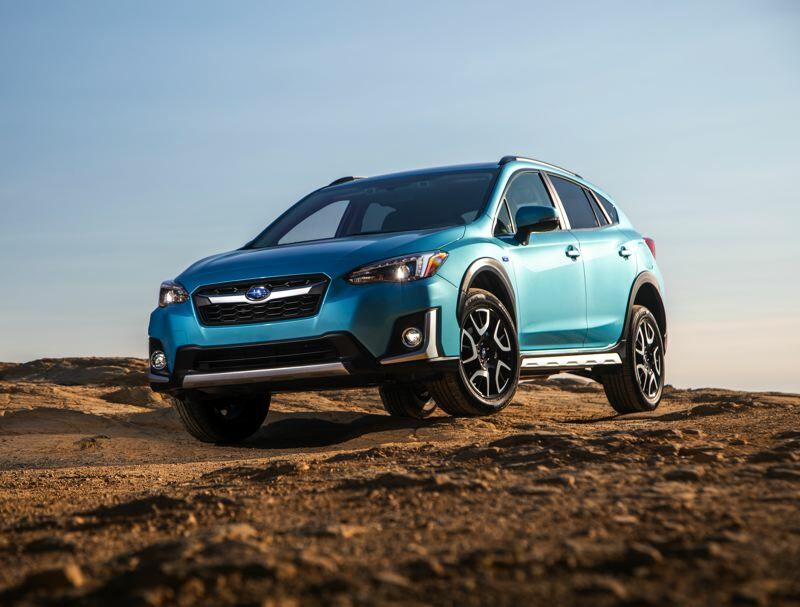 Subaru completely redesigned the Impreza and Crosstrek in 2016, making it even roomier and more attractive. The interior design was also improved and upgraded with higher quality materials, making it an even better PNW vehicle. Now, for 2109, Subaru has introduced a plug-in hybrid version simply called the Crosstrek Hybrid. The biggest benefit, of course, is improved economy. Gas-powered Crosstreks are EPA rated at 29 miles per gallon, while the new hybrid version can go 17 miles on electricity alone and then switch over a gas/electric hybrid mode rated at 35 miles per gallon. Subaru calls its new system StarDrive Technology. In a week of test driving without plugging in at every opportunity, I nevertheless ended up with just over 50 miles per gallon. My tester car was also faster than the gas-only Crosstrek because of the ample torque generated by electric motors, although no one will ever mistake it for a "hot hatch" like the turbocharged Impreza STI or WRX. 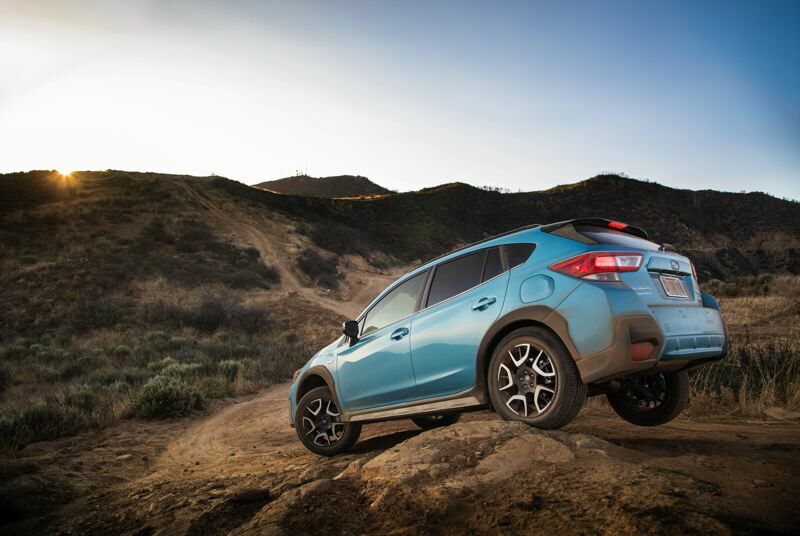 Although some hybrids and plug-in hybrids might get better mileage, the new Crosstrek Hybrid is probably the most off-road one on the market. 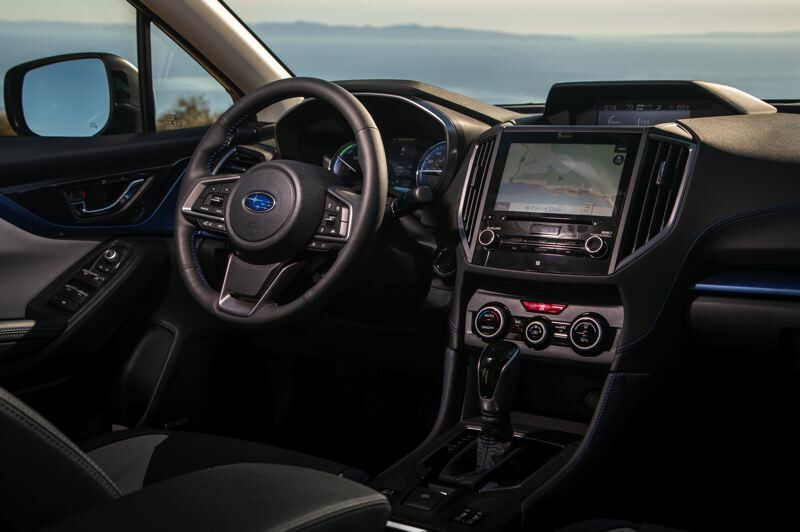 Although it has two electric motors in addition to its four cylinder gas engine, it retains the AWD system that has made Subaru a cult favorite among those who live in wet weather climates or spend a lot of time exploring the outdoors anywhere. Manufacturers have been trying to figure out how to make AWD hybrids and plug-in for a few years now. Most use two electric motors, with one driving the rear wheels when conditions get slippery. By retaining its original AWD ststem, the Crosstrek Hybrid should provide much better traction. And because it also keeps the 8.7 inches of ground clearance of conventional Crosstreks, the hybrid version is still a capable off-roader. During my week of daily driving, I found the 2019 Crosstrek Hybrid to be a fun and willing runabout that easily handled heavy rains and the deeply rutted unpaved roads that pass as streets in my part of town. I don't have a Level 2 charger at home, but it took only five hours to completely recharge the battery and get the promised 17 miles of travel on electricity alone. The switch to hybrid mode when the battery ran low was seamless, with only the gas engine occasionally kicking in to tell me it had happened. But I could also press and button and use the engine to recharge the battery as I drove on, allowing me to switch back to electric power alone after about 20 miles, at least for a little bit longer. 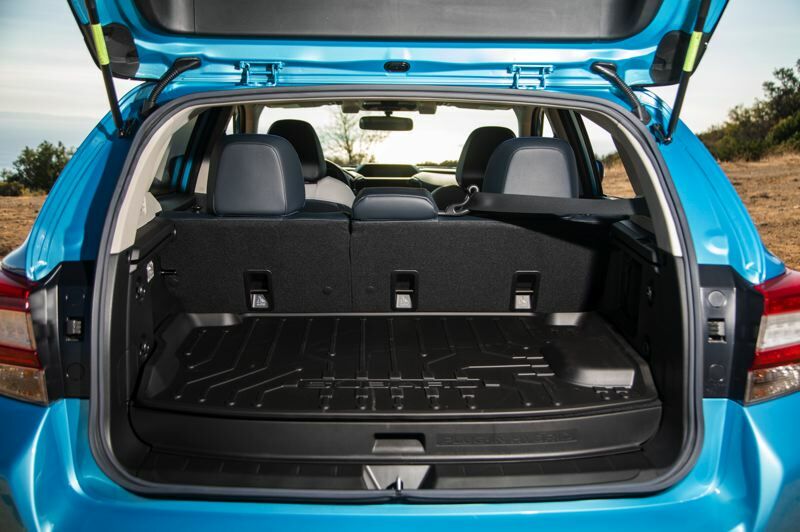 The hybrid version sacrifices some cargo space to accomodate the battery pack, but it retains every other improvement of the newest Impreza and Crosstek models. Like all hybrids based on conventional vehicles, the Crosstrek Hybrid is costlier than its gas-powered counterpart. In this case, it already inlcudes every feature of the top-of-the-line Limited model. The Crosstrek Hybrid starts at $34,995, which is $7,800 more than a "regular" Crosstrek Limited. But it qualifies for a $4,500 federal tax credit and a $2,500 Oregon rebate, which can close the gap considerably, depending on your federal tax situation. 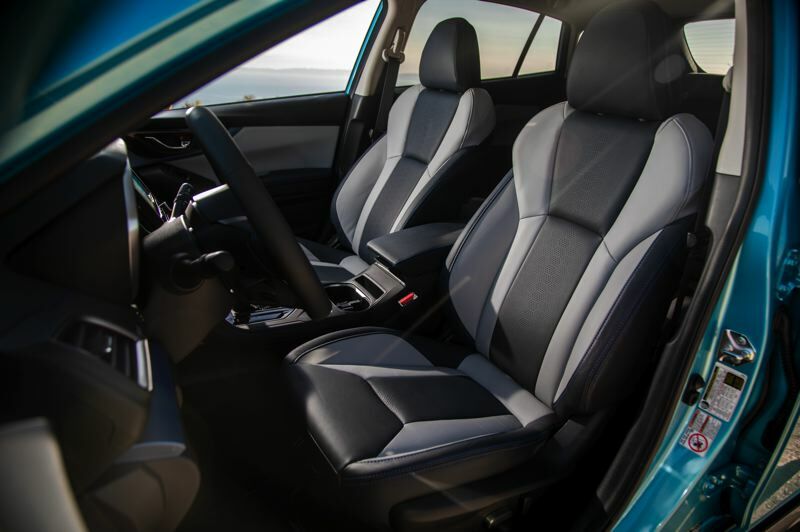 The 2019 Crosstrek Hybrid should appeal to Subaru fans who are willing to do everything they can to reduce their greehouse gas emission without sacrificing their ability to enjoy the outdoors.